Bring the birthday boy or girl in to count their candles any day during their birthday month, and the age they are turning is how much it costs to make their own Birthday Treat Bear! Regularly £14, Count Your Candles, pay your age – our birthday treat to you! Gift everyone on your list the newest furry friends in the Workshop! The Count Your Candles offer is for children under 14. 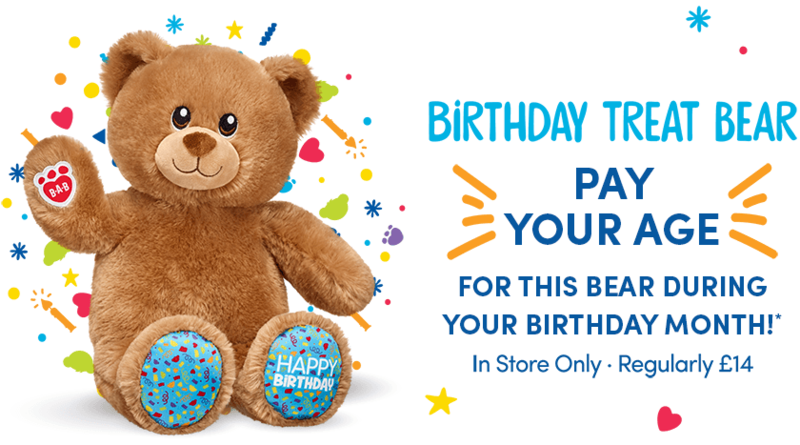 There is no minimum, you can be turning 1 and pay only £1 for the Birthday Treat Bear! This offer is available in all U.K. Build-A-Bear Workshop stores and outlets. At Build-A-Bear Workshop Outlet locations in the U.K. prices and details may vary. Not available in Ireland or Denmark. *Offer valid for Bonus Club members. Offer valid in stores only. Offer valid on Birthday Treat Bear only. Limit one per guest, must be present for offer. Cannot be combined with any other offer. While supplies last. Outfits and accessories sold separately. Minimum price £1. See an associate for details.